Exploding, rich and enchanting are the adjectives to describe the food in Tra Vinh, the southern Vietnam province, part of Mekong Delta, usually nicknamed by the local as “Coconuts’ Kingdom.” Although having mostly Vietnamese, “the Kingdom” is also populated with many members of the Khmer Krom ethnic group and one of the largest ethnic Hoa (Chinese) communities in Vietnam. Having the diversity in culture, Tra Vinh’s cuisines have enchanted and surprised tourists from both in and outside of Vietnam. 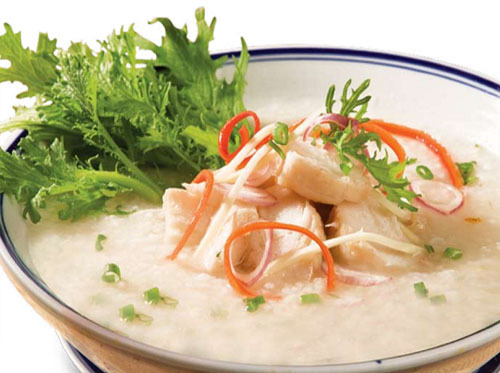 Cháo ám (Fish congee): In order to cook this dish, you must use all the part of the fish, even the water boils the fish. The steps to make this extravagant congee are quite simple. First of all, you need the fish. The fish must be full-grown and meaty. Cut the lean part of the fish into finger-long slice and then fry it with oil-sliced green onion. Use the boiled fish water to make the congee in clay pot. Remember that the congee must be completely cooked. Add a grill onion, dry shrimp, and grill squid to make the soup more dulcet. When the congee is ready with the entire flavors from onion and shrimp in it, add the fish into the congee. However, the fish egg has to be pureed then add into the congee. Cilantro, laksa leaves, boiled full-grown peas, and crushed grill rice paper with sesame to eat along with the congee are indispensable to the congee. 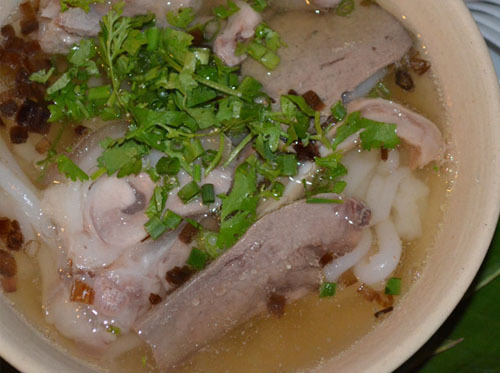 A bowl of Cháo ám usually costs about 20 to 25,000 Vietnam dongs. Bún suông (suong noodle): From many ingredients, Bún suông (suong noddle) is one of the best dishes in Tra Vinh’s extensive delicacies. To prepare the noddle, first you need the soup water that comes from the process of boiling pork’s bones. Season the soup water so it could have the taste of natural sweet. The sweet is not too much like sugar, but just perfect. If you want to try something extra, you could add the dry shrimp or the grill squid to increase the sweetness of the soup. The vegetable for the soup consists of sliced white cabbage, green onion, cilantro, soy sauce, a sliced of lemon. Last but not least, the shrimp rolls are the main protein source of the dish. And if you love your noodle to be hot, help yourself and put some chilies, but be careful. 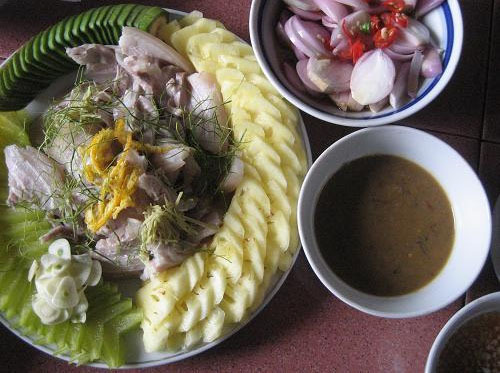 A bowl of bún suông usually is about 15 to 25,000 vnd. 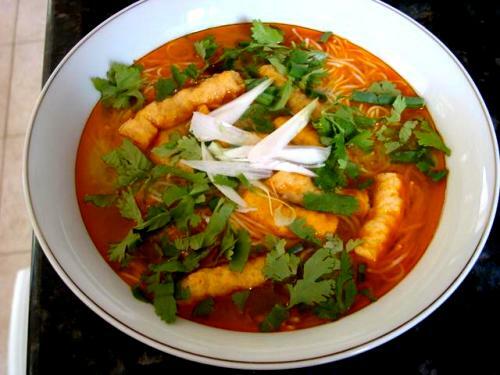 Bánh canh Bến Có (Ben Co soup cake): Like many soup cakes from all around Vietnam, the ingredients of the cake and the flavor of the soup water decide the success of the delicacy in the heart and belly of the tourists. The cake is made from rice flour so the cake could be crystal and a little bit tough, so the cake won’t lose it toughness when you put it into the soup water. The soup water, to have the natural sweetness, is needed to be making from the pork bones boiling water. You can put in the lean pork, pork nail, or pork bowel together. Banh Co soup cake is served with lemon fish sauce with some chilies slice floating. The richness of the sauce combines with others ingredients make this rustic dishes to become bold and more flavorful. 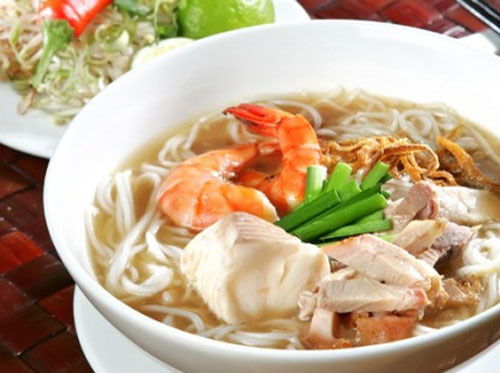 Noodle soups (Bún nước lèo): The bowl of “bún nước lèo” consists of snakehead fish, roast pork, shrimp and especially the “mắm bò hóc” (bo hoc sauce) to enrich the boldness and the brackishness of the soup. The noddle is usually made of rice flour to enhance the toughness and sweetness. However, to make the soup complete, you must add in the indispensible herbs such as boiled full-grown peas, chives, and sliced banana leaves. A bowl of Bún nước lèo usually costs reasonably from 20 to 25,000 Vietnam dongs. Chù ụ rang me (tamarind-roasted Chu U): A few things about Chù ụ. They are salt-water-crab-like crustaceans live off the coast of Tra Vinh province. The first thing to do is to clean the “Chù ụ.” Then you must ready the pan with cooking oil, minced green onion and garlic, tamarind juice and then season so that the sauce can have the both the taste of sour and sweet. 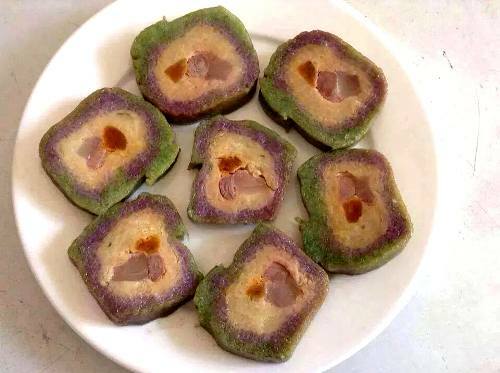 The lean meat of Chù ụ is tough, but not too much. The shell is enriched with calcium, and as well as the flavor of the sea. If you are the person that loves seafood, so this is the right choice for you. 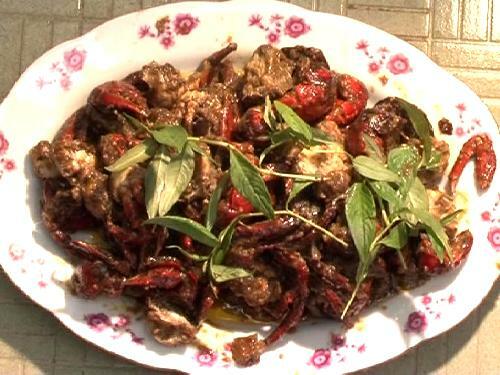 There are also many other ways to cook “chù ụ” such as steam or boil. A dinner by the beach of “Chù ụ” for two people with six to seven “chù ụ” is ranging from 60 to 70,000 vnd. Tôm khô Vinh Kim (Vinh Kim dry shrimps): The reason for the outstanding quality of Vinh Kim dry shrimp is because they were shrimp in the area which is close to the Tra Vinh coastal, where there is less pollution and human activities and better habitats for the shrimps. The luscious shrimps are which are very different from other areas because they have the pink-red color with richness in every bite. The shrimps are selected, boil with medium fire, and are dried with the right technique and with the perfect amount of sun. 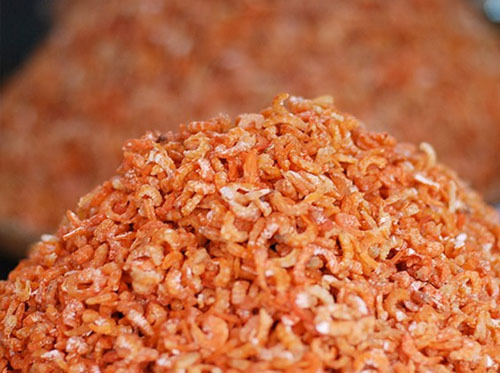 In order to create one kilogram of dry shrimp requires ten kilograms of fresh shrimps, and the price for one kilogram is ranging from 600 thousands to 1.2 million vnd depends on the kind of shrimp. 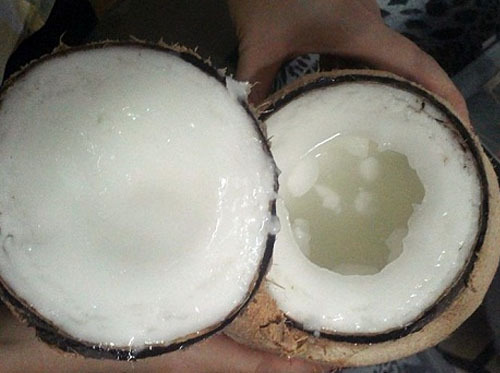 Dừa sáp Cầu Kè (waxed coconut Cau Ke): The tasteful and juicy coconut has a very odd adjective in front of it. The locals call it waxed coconut because of the interior of the coconut: the coconut is almost solid inside with very thick fresh copra that is slushier and more buttery and the juice is crystal. Another curios feature is that from every coconut chamber, there are only a few “waxed,” the rest are just regular coconuts. The people in Tra Vinh use the coconut as drinks, candy-making ingredients, copra, jelly, jam, ice cream, or even wine. Price for a single coconut is usually ranging from 130 to 240,000 vnd depends on the size of the coconut. Rượu Xuân Thạnh (Xuan Thanh wine): Followed the hundred-year-old family secrets, the wine are made complicatedly from sticky rice that was ferment from 36 different types of Chinese traditional herbs. The sticky rice is cooked, and allowed to cool down in order to mix with yeast. Then the wine is sealed and put away for three days. After that, water is added into the sticky rice fermented with herbs for another three days. The next step, the water extracted from the jar is taken to a distillation process. The Xuan Thanh wine is about 60 alcoholic units, which is strong and tasteful traditional type of alcohol that can be brewed at home but still not very dangerous to the users. A 500 ml bottle of “Rượu Xuân Thạnh” is about 38 to 47,000 vnd. Bánh tét Trà Cuôn (Tra Cuon sticky rice buns): The traditional Vietnamese dish is made from the main ingredients that can be found in most of the traditional Vietnamese delicacy: rice, pork, and other special things like banana leaves oiled with pork grease. The rice is washed and then dried of water. Then the dried rice is mixed with the sauropus androgynous juice (also known as katuk or “rau ngót” in Vietnamese) to create the color and flavor. The pork will be boiled and then been rolled inside the sticky rice. The banana leaves now will be used as the cover for the buns. The buns are not overly tie, and cooked in medium fire for many hours. The price for a 900 gr Bánh tét Trà Cuôn is about 40 to 50,000 vnd. Nước mắm rươi (Fish Sauce): The special fish sauce of Tra Vinh which only needs a type of little fish called “rươi” added with salt and water with the ratio of five kg of “rươi” to one kg of salt and four liters of water. Then the combination is sealed from 10 to 15 days. The fish sauce is used with herbs, boiled shrimps or pork, plain congee… The sauce has a color of yellow and a little blue. The sauce doesn’t have the bold flavor such as the Phú Yên or Phú Quốc fish sauce (islands on the Western side of Vietnam), but this fish sauce is sweeter. The price for a liter of the fish sauce is from 20 to 32,000 depends on the protein quantity.